My day 3 reveal for Artistic Outpost uses images from Snowy Woods, to create a Christmas Gift. I love making gifts for Christmas and found the perfect thing to alter....I think I should go back and purchase all the paperweights from my local stores, before I tell you all where I got them....Remember the Test Tube Holders I posted - can't find a single package of Test Tubes to save my life these days! My box is created from Chocolate Chip card stock and the new Ski Slope DSP, available in the Holiday Mini. The ribbons and rope twine also come from the Holiday Mini and will be available for purchase on October 1. 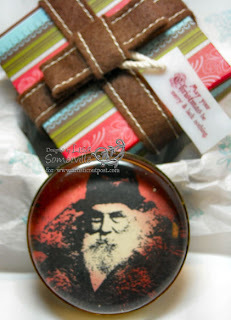 The beautiful Santa image is stamped in Black Archival ink on a manilla tag, then heat set. I applied Fired Brick Distress ink with around the edges, than blended in Aged Mahogany and Black Soot. 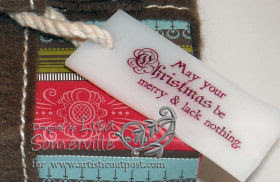 For my tag, I stamped my sentiment from Snowy Woods on shrink plastic in Blazing Red stazon, then shrunk it. I did punch my hole before I shrunk my image, but while it was still warm, I punched it again with my Crop-a-dile. Be sure check out what the other members of the Artistic Outpost Design Team have been working on. WOWZA! This is so kewl! And it's got it's own box! too cute - love that little box too! Wow! This is too cool! Love how your paperweight turned out. Lisa this is beautiful!! I love it! !